I had an amazing time at my first MVP Global Summit. The MVP Global Summit was hosted in Bellevue and at the Microsoft headquarters in Redmond, Washington. It featured a large catalog of in-depth technical discussions and feedback sessions combined with networking opportunities among fellow MVPs and the Microsoft product groups. It was held the week of 17 March 2019. There were community pre-day sessions on Sunday 17 March and the product group technical sessions ran from Monday 18 March until Wednesday 20 March. On Thursday 21 March and Friday 22 March the Power BI and Azure product teams hosted additional sessions and workshops on campus. As a first time attendee I didn’t know anything about the conference.There was finding out about transfers to and from the airport to the hotel, having a map of the Microsoft campus and the need to download a few apps such as Uber and the event mobile app to select the sessions I wanted to attend for my award category and for conference updates when I was there. The conference hotels were in Bellevue and I stayed in the main hotel, the Hyatt Regency. The sessions on the Sunday and a number of evening events were all held in the Hyatt. Every day there were buses that took MVPs from the hotels to the main conference centre at Redmond. These ran regularly throughout the five days. From the conference centre there were transfer buses that could take you to any of the other buildings. Some of the building were within 5 mins walk. With the weather like summer it was a pleasant stroll through the tree lined undulating campus roads and paths between the buildings. By one of the buildings was the three tree houses which can be used for meetings. The Microsoft Store was in another part of the campus. During the week I also had to travel to another building Advanta which was 15 mins away from the main campus. The events on Sunday covered important topics such as diversity and inclusion and how to improve your presentation skills. It was a very helpful day to focus on soft skills. Also I was very grateful to have a new professional headshot taken for LinkedIn. Then five days of sessions with the different product groups. There was so much content to learn and absorb. In the evenings there was plenty of time to network with other MVPs and the product groups. One evening meetup was with the MVP leads, a couple were with the Data Platform product group on Tuesday and Thursday on campus. Then there was the main attendee celebration to celebrate one global community on Wednesday. Throughout the whole event there were opportunities to network, meet new people, catch up with people I knew and discuss data platform things. It was also a great opportunity to have a Data Relay team meeting. It is such an amazing privilege to be a part of this community with so many amazing people. It is that time of year again already. Data Relay session submission is open. There is a great blog post talking about Why to speak at Data Relay. Submit your sessions and start your journey. I have the privilege to have been chosen to be in the 'Top 100 Inspirational Woman in the West' for 2019. West Women of the Year is to recognize the women in our region who continue to champion gender equality a hundred years on, in celebration of a century of women's suffrage in Britain. The award shares the stories of inspiring, dedicated and high achieving women from all walks of life who are making a difference in their workplaces and communities.The event webpage gives more information. There are various categories and the winners of each category are selected by the judges apart from the people’s choice. For one of the awards there is an online poll. That is for 'The People's Choice' category for the 2019 West Women Awards. The voting form is available here and it would be amazing to get some people to vote for me. I'm listed under Dr Victoria Holt. Please note that the poll will be open until Thursday 25th April 2019. 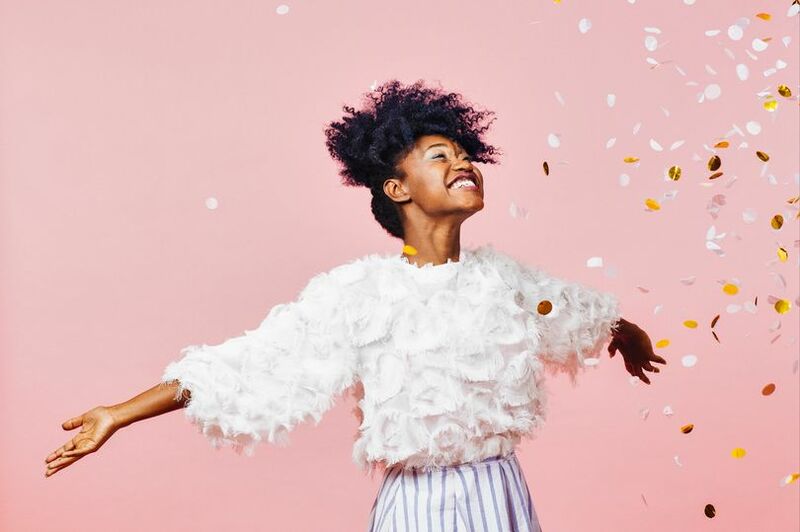 The Stanford University's Women In Data Science (WiDS) initiative, The Data Lab, Turing's Testers along with their primary sponsor Mudano, have created an event that celebrates women, tech, innovation and codebreaking! This event brings together women data scientists and school girls to showcase what a data career looks like, and inspire the female data leaders of the future. The aim is to inspire school girls to consider STEM and data related careers by bringing together the girls with inspiring women working in the field of data science and to expose them to some fun activities that are powered by data. 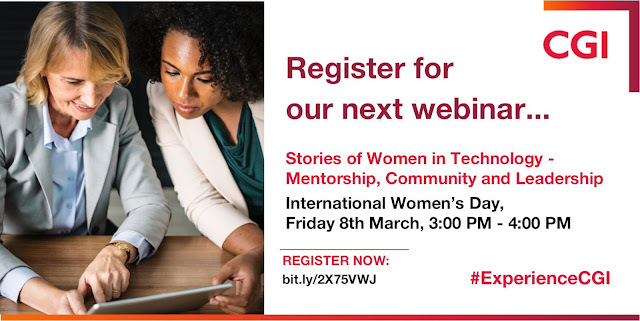 I have the privilege to attending the event, on behalf of my employer CGI, to participate as a mentor and to speak to the girls to share the wonders of working with data. Women in Data Science is on 11 March 2019 at the National Museum of Scotland in Edinburgh. It is one of the fringe events of the UK’s first two week festival of Data Innovation in Scotland from the 11th to 22nd March 2019 and in its third year. DataFest will showcase Scotland's leading role in data science and artificial intelligence with networking from industry, academia and data enthusiasts. The Cyber Treasure Hunt has been created by Turing's Testers, a group of motivated pupils and STEM ambassadors; inspiring, engaging and supporting girls into the technology sector. This has been running over a number of months with codes being released every few weeks. For a school to gain invitation to this event they must crack the codes. This event will be the final code cracking session with the winner being announced at the end of the day. The event will be broken into a number of sessions and vary between workshops and talks. Talks will be led by various female thought leaders from the world of tech, including none other than Hannah Fry. Attendee spaces are limited at this event. We expect tickets to sell out quickly, however will have a waitlist and will inform you if you have secured a place. Attendees will have a hands on role as part of this event and will be asked to help out with mentoring and guidance to each of the groups throughout the day. This event also plays part of DataFest, kicking off proceedings on the first day of the two week festival of data science. International Women's Day is fast approaching. It is celebrated on 8 March every year. It is a celebration of women globally. It is a chance to network, be inspired and share your stories to empower each other. The Official UN theme for 2019 is Think Equal, Build Smart, Innovate for Change. The theme will focus on innovative ways to advance gender equality and the empowerment of women, particularly in the areas of social protection systems, access to public services and sustainable infrastructure. I am excited to be contributing to a webinar for International Women's Day 2019. The webinar discussed women's roles in the field of technology. The Tree of Learning sculpture is a stunning celebration of the last 50 years of The Open University and an inspiration for the future. As part of the 50th Anniversary celebrations the “Tree of Learning” sculpture is being created and will be installed on campus, later in the Anniversary year. 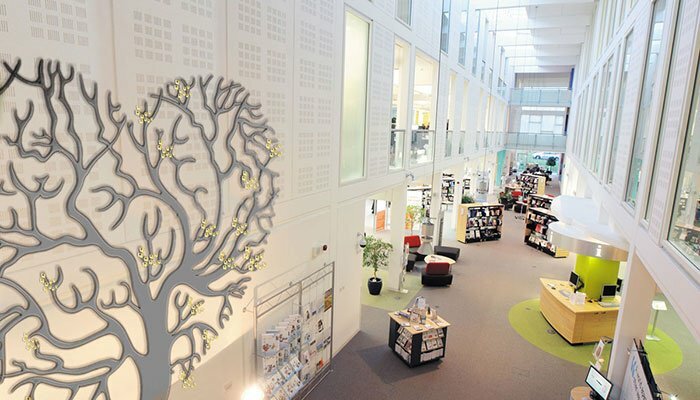 It will contain of hundreds of individually personalised gold-coloured OU logo-shaped shields hung as leaves on the tree. If you’ve studied with, worked with or been involved in some way with The Open University, it is a great way to still be a part of the amazing story to come. I am proud to have been a part of The Open University for over 13 years. This year SQLBits 2019 had a keynote. It was nice for the event to have a keynote again. The theme Data Never Rests. The Microsoft Data Platform Product group who spoke were Buck Woody, Bob Ward, Anna Thomas, Alain Dormehl, Adam Saxton and Patrick LeBlanc. An amazing set of speaks and fun keynote. They shared details of the evolution of the data platform to enable people to keep their skills up to date. The keynote is available to watch . There were several major announcements. SQL Server 2019 is a modern innovation and there are various forms of the product. 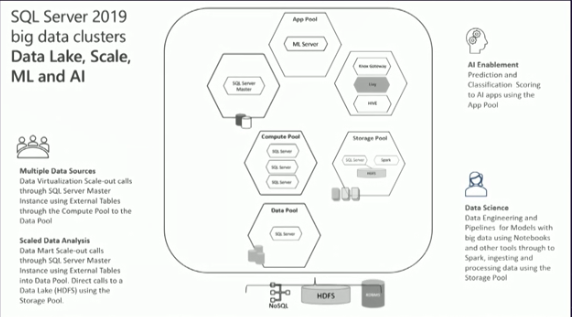 Azure SQL Database Hyperscale can autoscale up to 100TB and scale compute and storage independently. 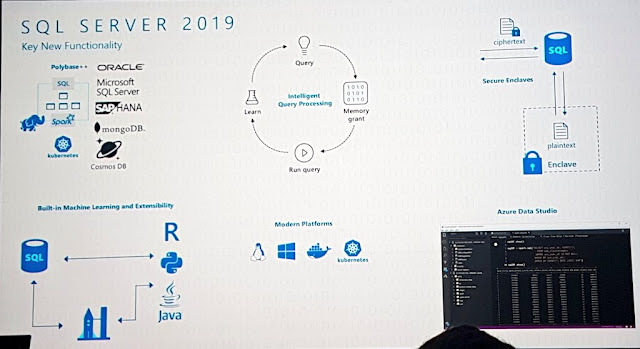 During the keynote they showed Azure SQL Database Hyperscale where a 50TB database was restored in just under 8 minutes. That is nice accelerated database recovery. Data virtualization and big data clusters is a game changing view with SQL Server 2019 big data clusters, data lake scale, machine learning and AI. Multiple data sources can be connected using external table, through the compute pool using Polybase connectors at the source. Data persistence using multiple data sources is stored in shards of the data pool for SQL Server 2019 big data clusters data mart. 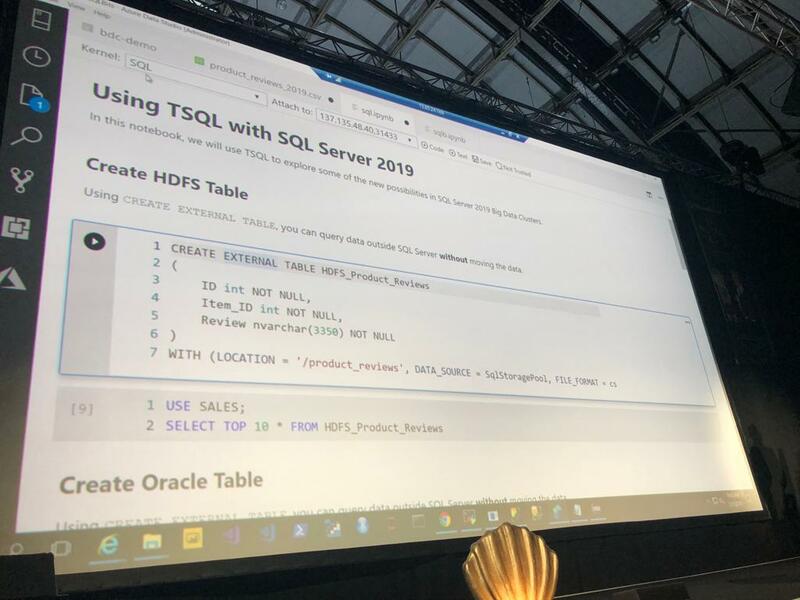 SQL 2019 will send push down predicated queries to other data platforms via Polybase to join SQL data with Oracle, Mongodb and CosmosDB data in one place efficiently. SQL notebooks in Azure Data Studio is an awesome new feature. There is documentation to read and new courses for learning. and a Summary of All Exams and Certifications Launched in January, 2019!